The Town’s International Lawn Tennis Centre has been used as a location for shooting ads for ‘Müller Rice’ and ‘T-Mobile’. Popular monthly market selling local fresh produce, including meat, bread, cheese, fruit and vegetables, home-made cakes, pies and scones, honey, preserves, sauces, vinegars and spices. 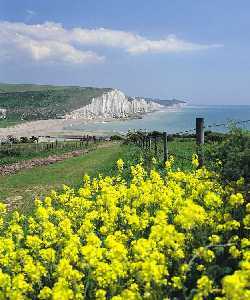 Found at the point where the South Downs meets the sea, the Sisters were created when ancient rivers cut valleys into the chalk, creating seven peaks. Hidden away below Helen Gardens at Holywell are the Italian Gardens. These unusual and secluded lawned Gardens sit in a wooded amphitheatre carved out of the cliff face just yards from Holywell beach. A compact garden with a pond that is the source of the Bourne Stream from which Eastbourne derives its name. Sheltered lawns for picnicking and an adjacent bowls club are overlooked by an historic circular dovecote. The world class tennis courts at Devonshire Park play host to six major tennis tournaments each year.